Chabad organizes fully-funded cruise, trip to Auschwitz, for Russian Jews who attend classes on Judaism. 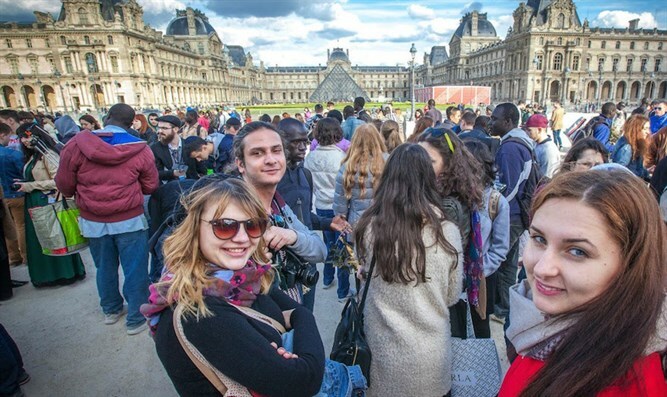 Participants in the Eurostars trip to France in 2015 at the Louvre Museum in Paris. Growing up in a working-class family in Russia’s Far East, Sergei Aryeh Zolotov knew the French Riviera only from what he’d seen in James Bond movies. 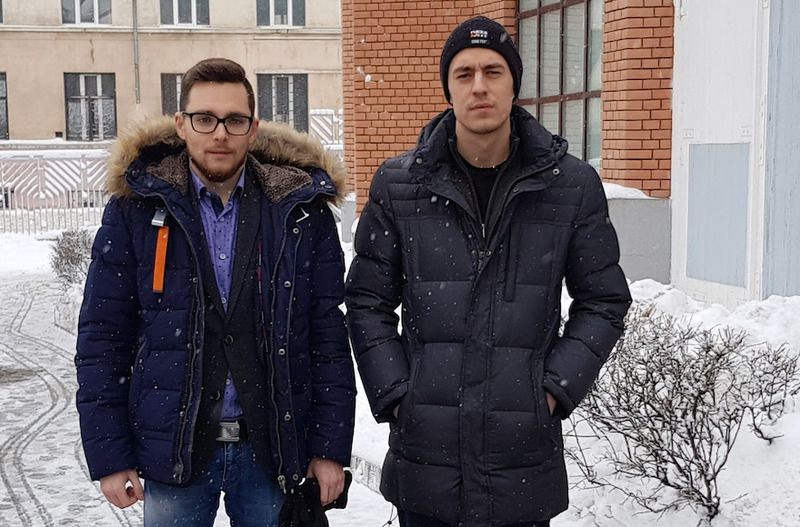 A student in his 20s from the city of Khabarovsk, 4,000 miles east of Moscow, Zolotov had neither the means to travel to the sunny beaches of southern France nor to obtain the visa that Russian citizens need to enter the European Union. Luckily for Zolotov, he didn’t need to worry about any of that. All he had to do to visit the famed beaches of Cote d’Azur was to show up for a few months of weekly Judaism classes at his local synagogue, thanks to Russia’s Eurostars program for young Jews from the former Soviet Union. Launched in 2012 by the country’s branch of the Chabad hasidic movement, the program takes hundreds of Jewish men and women aged 18-28 on fully subsidized trips each spring to Europe. The Eurostars trip features a visit to the former Nazi death camp of Auschwitz in Poland along with different destinations every year. But to earn a free ticket, participants must attend 85 percent of a yearlong program studying Torah and Jewish traditions. Coming from Khabarovsk — a landlocked and icy place situated 800 miles northeast of the North Korean capital of Pyongyang – “I never thought I’d get to go on a Mediterranean cruise,” Zolotov told JTA last week in Moscow, where he moved last year to work as an economist. Zolotov attended the 2017 trip. “Frankly, I signed up because a friend told me it’s a classy cruise with guys and girls for free,” he said. But Zolotov said the utilitarian approach changed as he connected to Rabbi Yaakov Snetkov and his small but warm community. The connection “changed me forever, more than any cruise ever could,” he said. Following the trip, Zolotov had a belated circumcision. For eight months in 2016, Zolotov joined a handful of other Eurostars participants in Khabarovsk who studied the weekly Torah portion on Sundays. Last May, they and groups like theirs from more than 40 cities across the former Soviet Union gathered in Moscow for a week-long trip costing many millions of dollars that was paid for in donations to Chabad of Russia. 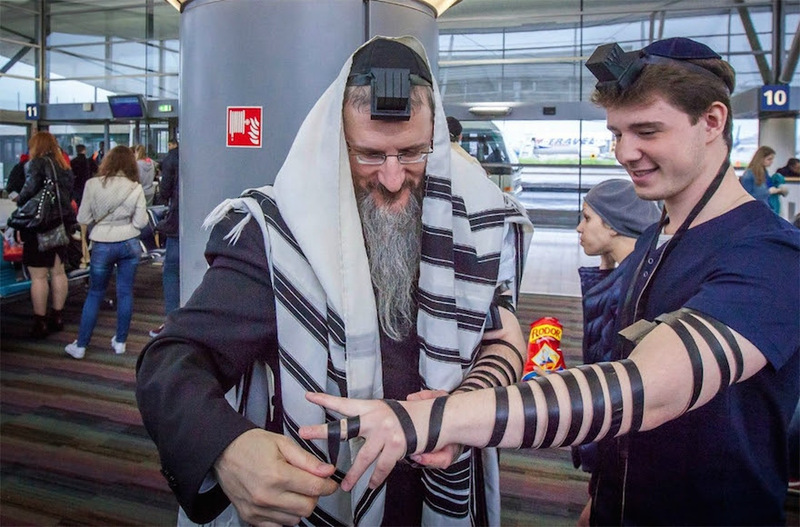 With visas pre-arranged for them by the Chabad-affiliated Federation of Jewish Communities of the Commonwealth of Independent States, the approximately 1,000 participants boarded two chartered airplanes to Barcelona, Spain. They toured the sites connected to that city’s rich Jewish heritage. Traveling in 20 buses, they boarded a Grandi Navi Veloci cruise ship to Italy and Monaco, giving the latter’s tiny Jewish community the largest Jewish event in its history. Then they flew from Nice to visit Auschwitz before returning to Russia. Matchmaking is part of the Eurostars raison d’etre, according to Rabbi Mendy Wilansky, head of the Yachad special programs platform, which is responsible for Eurostars within the Federation of Jewish Communities. The cruise featured popular speed dating evenings, he said. “In a huge country like Russia with massive assimilation, of course it’s an opportunity for shidduch,” he said. Among those seizing the opportunity were Yosef and Sarah Vasilyev, participants on the 2015 Eurostars trip. Yosef, a Jew from the Siberian city of Tyumen, became engaged to Sarah from the nearby city of Chelyabinsk just days after returning from France. Their wedding in the synagogue of her hometown was a rare celebration for her graying community and featured prominently in its newsletter that month. Zolotov also came on the Eurostars program hoping to meet his “other half,” but it was the visit to Auschwitz that ended up changing his life, he said. To Berel Lazar, a chief rabbi of Russia, the program’s success - participation has quadrupled over the past six years - is indicative of a major shift in European Jewry. It was vividly on display during the 2015 trip to France, Lazar said, when he led participants on a solidarity visit to the Hyper Cacher kosher shop in Paris, where earlier that year an ISIS terrorist killed four Jews. Some Eurostars participants had a better idea than Zolotov of what to expect, including Lev Aryeh Osifov of the Siberian city of Tomsk. A graduate of the Taglit-Birthright program of subsidized trips to Israel for young adult Jews, he had been to Western Europe before coming with Eurostars. Unlike the Taglit-Birthright program, which participants can only attend once, Eurostars students can go up to three times. Despite having little knowledge about Judaism, Zolotov had a “powerful connection” with Jewish texts early on in the study program, according to Wilansky, the rabbi. Nonetheless, financial incentives are a necessity in a poor country where Jewish life had been driven to the point of near extinction amid communist repression, assimilation and mass emigration. The Eurostars program, he said, grew out of an earlier framework in which rabbis offered cash payments to Jews who agreed to take part in Jewish studies programs by Jews. That was the case for Ruth Galeyeva, a participant on the 2015 trip. She hails from Orenburg, a city located 800 miles east of Moscow, near Russia’s border with Kazakhstan. And as a former design student, she also wanted to see Paris.